Hype Girlz Anti-Bullying Anthem "Stand Up" is released, as fans continue to pledge their support in unity by adding their thumb prints to their "Stamp Out Bullying" pledge book. 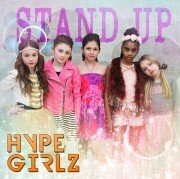 New York, USA, May 19, 2015	(Newswire.com) - The Hype Girlz are a singing group made up of five in-demand child actresses and models who range from 8-11 years old. They were formed to promote courage and self-confidence and empower girls to strive to make a difference. The girlz have been performing at events in the Tri State area, where their fans have been signing their "Stamp Out Bullying" pledge book with their thumb prints. They will be honored by Teach Anti-Bullying for their song and for raising awareness. They each have a trend setting nickname to describe their fashion sense. Their YouTube video has already had huge success. They spent the past week filming their second video for The Clapping Song, which will be released in a couple of months. Live Music Entertainment in the Tri State are. DJ's, Musician's & Bands.